Synopsis : Overview and list of online instant messenger (IM) programs that allow you to talk and communicate with friends and family around the world. Using today's computer coupled to the Internet, or world wide web (WWW), it is possible to IM (instant message), e-mail, and use chat rooms to communicate with friends and family virtually anywhere in the world. It is even possible to communicate with complete strangers anywhere on the globe who may happen to share the same interests as a person from the home, office, car or even Internet cafes where it is possible to rent computer time by the hour. This form of communicating has altered the day to day lives of billions of people. Instant messaging (IM) is defined as a type of online chat which offers real-time text transmission over the Internet. A LAN messenger operates in a similar way over a local area network. Short messages are typically transmitted bi-directionally between two parties, when each user chooses to complete a thought and select "send". Some IM applications can use push technology to provide real-time text, which transmits messages character by character, as they are composed. More advanced instant messaging can add file transfer, clickable hyperlinks, Voice over IP, or video chat. IM, or instant messaging, is a communication methods that literally caused a craze around the world due to instant messaging being practically free, quick, and extremely easy to use. Instant messengers or IM's are generally free down loadable programs that enable you to communicate via text (typing), voice, video (webcam) or even a combination of all three. By downloading an instant messenger chat program and connecting a microphone and webcam to your computer it is possible to both see and hear each other no matter where in the world you both are located. This makes for an extremely useful means of communicating with friends and family both near and far, especially when it costs you nothing more than your standard Internet connection. That's right IM's are free and will even work over a dial up Internet connection, though cable offers slightly superior quality in terms of video speed. Our lives have been changed so much by the latest communication revolution that there are chains of thought that are concerned about a persons isolation and detachment from the physical world due to the addictive nature of computer communication. Another problem that people advocate is that by using the mask of a computer and no real live interaction going on, instant messaging provides the perfect atmosphere for multiple personality identities. However on the other hand there are people who believe this new form of communication actually expands ones social circles. This leads us to the question, does today's online communication methods, in particular instant messaging, e-mail, and chat rooms, destroy relationships or help them develop and mature? Are relationships hindered or flourished from this type of new environment? One fear with many of today's parents is that their children will fall into their own virtual online world of communication and completely shut themselves off from the real world around them. Google Talk (Google Chat) is now known as Google Hangouts a communication platform developed by Google which includes messaging, video chat, SMS and VOIP features. Google Hangouts instant messaging service is commonly referred to as "Gchat", "Gtalk", or "Gmessage" by its users. Google Hangouts allows conversations between 2 or more users. The service can be accessed online through the Gmail or Google+ websites, or through mobile apps available for Android and iOS. As Part of its Commitment to Serving Customers with Disabilities, AT&T Is First Provider to Enhance IM Relay Services. Users log in to a specialized AIM interface that works with an Internet connection on a PC and on many wireless devices. The company has upgraded the service to allow real-time communication between callers - Instead of waiting for the relay operator to input long strings of text, users receive the messages word by word as they're typed. For many callers with hearing or speech disabilities, this creates a wireless and online communications experience much closer to what hearing people encounter when talking with others on the phone. The new service is offered at no additional charge to customers who register with AT&T Relay Services. MSN Messenger, later rebranded as Windows Live Messenger, was a cross-platform instant messaging client developed by Microsoft. It connected to the Microsoft Messenger service while also having (as of the final version) compatibility with Yahoo! Messenger and Facebook Messenger. 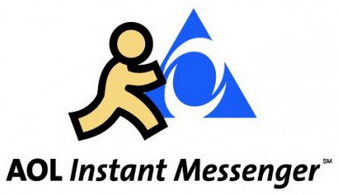 The popular AOL AIM Instant Messenger yellow running man icon - logo. MySpaceIM was the official instant messaging client for the social networking site MySpace. Microsoft NetMeeting is a discontinued VoIP and multi-point videoconferencing client included in many versions of Microsoft Windows (from Windows 95 OSR2 to Windows XP). Microsoft NetMeeting was a complete VoIP Internet conferencing solution for Windows users with both text and voice chat, multi-point data conferencing, whiteboard, and file transfers. Parallel to instant messaging were early online chat facilities, the earliest of which was Talkomatic (1973) on the PLATO system. IM allows effective and efficient communication, allowing immediate receipt of acknowledgment or reply. Non-IM types of chat include multi-cast transmission, usually referred to as "chat rooms"
Modern, Internet-wide, GUI-based messaging clients as they are known today, began to take off in the mid-1990s with PowWow, ICQ, and AOL Instant Messenger. Early instant messaging programs were primarily real-time text, where characters appeared as they were typed. Facebook Chat is a form of instant messaging, and Twitter can be thought of as a Web 2.0 instant messaging system. Users sometimes make use of internet slang or text speak to abbreviate common words or expressions to quicken conversations or reduce keystrokes.